The striking thing about the issues that have political coverage over the past few months is the almost total lack of policy content to any of them. To date, Her Majesty’s Opposition hasn’t shown the slightest interest in offering a competing vision for the delivery of say, health, education, housing, wage increases or climate change solutions. Instead, they’ve been entirely focussed on failings in Beehive management: Clare Curran’s management of her diary and email account, Meka Whaitiri’s treatment of her staff, the level of attention paid to business over its sense of self belief, the management of messaging about the refugee quota… None of these matters have involved policy outcomes or the contest of ideas. Each has been about the managerial competence of the coalition leadership. Because of this lack of policy substance, the crises have left virtually no trace. The bogus ‘crisis’ in business confidence blew away in the face of consistently strong economic results. NZF’s misgivings about the refugee quota came to nothing. Curran resigned, Whatairi was demoted. The coalition government stayed together, and moved on. On the bigger issues, there has been a policy vacuum. Can anyone point to a single new policy, idea or innovation that Simon Bridges has promoted, since becoming leader of the National Party? It is as if time has stood still since the last election. Moreover, if we’re talking about consistency, unity and in the government… Bridges had hardly been a model of stability himself. Initially, he came out in support of the nurses over their strike action, and then condemned the strike as a sign of rising industrial instability. Similarly, on the HNZ meth homes evictions, Bridges first said the tenants affected deserved an apology but has since denounced them as meth crooks who don’t deserve compensation. It has smacked of opportunism and it looks desperate. Any side of an issue will do, so long as it offers him a bit of traction. As for unity… a still unidentified member of his caucus leaked information to discredit his leadership. By comparison, Winston Peters has been a virtual model of consistency. The pattern that’s emerged with Peters is that he will – as leader of New Zealand First – articulate his party’s position first, and speak to its base. Then, as deputy prime Minister, he will hammer out a compromise with Labour and stick to it. So far, it has been a reasonably impressive balancing act. A necessary show of independence, but under the umbrella of unity. One thing we do know, however, is that Republicans have decisively lost the battle of ideas… In fact, Republican policies are so unpopular that the party’s candidates are barely trying to sell them. Instead, they’re pretending to stand for things they actually don’t — like protecting health coverage for Americans with pre-existing conditions — or trying to distract voters with culture war and appeals to white racial identity. The G.O.P. has become the party of no ideas. Start with health care….. The residual question being… why would anyone think such policies would be enduringly popular? In New Zealand, our schools and hospitals were run into the ground. Pressing problems in housing were ignored. Assets owned by everyone were sold down to the ten per cent of Kiwis who invest in the sharemarket. GDP figures kept growing, but wage levels kept on being held down. On the economy, a failed 30 year old policy programme – tax cuts plus depressed wages plus shrinking public services – has finally run our of steam. So far, Bridges has offered no new ideas to restock National’s policy cupboard. Despite an inherently difficult –to-manage coalition involving three quite different parties, such problems are now being addressed. Inevitably, the delivery will be messy. In order to be re-elected in 2020, the two minor parties must be able to point to gains they have won from being within government – yet those gains cannot be allowed to capsize the coalition. Conversely, whatever the cost to “unity” that may result, this unity cannot be bought by NZF and the Greens functioning as the mere enablers of Labour policy. Despite these identity issues, the coalition does seem jointly committed to tackling the problems created by the prior years of neglect, and to assisting the people and communities left behind. However clumsily these tasks are managed, it seems unlikely that after three years, the public would be still hankering for a return to the past. Come 2020, National will need to have embraced the changes, moved on and have fresh policy alternatives on offer – in healthcare and its funding, in education and on climate change. 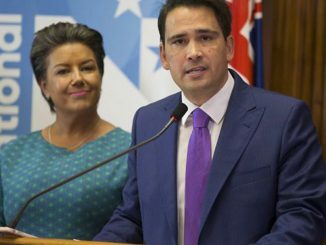 Is Bridges capable of carrying out that necessary task of renewal – especially when he is still looking over his shoulder at the threat to his leadership from Judith Collins? It doesn’t seem so. So far, National has focussed its efforts entirely on undermining faith in the coalition’s competence at steering the ship of state. It has offered absolutely no fresh ideas about what the ship’s destination should be, or how it could better get there. In the 1950s, comics used to be decried as a moral threat to American youth… but now, the upcoming Captain Marvel movie is being seen as (a) the latest incarnation of the female-empowerment superhero, kicked off last year by Gal Gadot in Wonder Woman and as (b) a really, really useful recruitment tool for the US Air Force. As for female empowerment… in the Captain Marvel movie, Brie Larson plays Carol Danvers, a crack fighter pilot who receives superhero powers after an encounter with aliens, and said powers then come in mighty handy when Earth becomes a battleground between warring alien civilisations. Yet… while Larson may be a kickass pilot and the saviour of humanity, the film’s trailers have run into a lot of flak online because she doesn’t smile enough while she’s doing it. Because women are supposed to smile in all circumstances, right – on the street, at work, on all occasions. Lighten up, lady! Larson has reacted to the double standard by Instagramming a few posters of iconic male superheroes who have had silly, inane smiles photo-shopped onto their faces. Here’s an article on why expecting women to smile is not a reasonable or healthy, or sane expectation. And here’s an article from Reductress on why doing the opposite isn’t such a good idea, either. The headline act for next January’s Laneway one day festival would probably be Florence and the Machine, but… here are a couple of other names worth the investment. DJDS are Jerome Potter and Sam Griesemer, a couple of producers from Los Angeles who worked on Kanye’s Life of Pablo. Earlier this year, their own Big Wave More Fire album featured interesting collaborations between the likes of the young r&b star Khalid, the rapper Vic Mensa and Broken Social Scene’s indie veteran Kevin Drew, among others. In this great cut released in March, DJDS inventively brought together Khalid, the Canadian soul singer Charlotte Day Wilson, and old timer Charlie Wilson, the former lead singer of the 1970s/80s disco hit machine, the Gap Band. In an entirely different style, here’s a favourite Mitski cut from her previous album, Puberty 2.